Our organization is run by its National Executive Committee (NEC) which is comprised of national leaders elected by the General Assembly, and all chapter presidents. The NEC generally meets by phone conference on the first Sunday of each month, beginning at 7:00 PM EST. For more information please use the "Contact Us" tab on this website to get our phone number, or send a message to be forwarded to the appropriate party. Mrs. Susan Jiofack Tar graduated from Saker Baptist College in 1994. She holds an LL.B from the University of Yaounde II, Soa, Cameroon and an LL.M from the Widener University School of Law in Wilmington, Delaware. Upon graduation from law school, Susan worked in the legal, health, and IT fields specializing in Audits and Security Compliance. She is currently working as a consultant for one of the Federal Agencies. Until her election as National President, she was the chief whip of the DC Metro chapter and the founding chairperson of ExSSA USA’s National Conflict Resolution Committee (NCRT).Susan is goal oriented, open minded, and objective in her approach to problem solving. She is married with 3 children and enjoys family life, movies, traveling and academic work. She lives with her family in Fairfax County, Virginia. I’m Isabelle Ebangha Atem, live in Minnesota, married to peter Eyong for 13 years. We are blessed with two beautiful children Mayabelle eleven and Minerva six. My hubbies are traveling, dancing and enjoy spending quality time with family and friends. Despite the fact that our human nature never permits us to be contented with what we have, watching my two little girls grow each day gives me a sense of joy, hope and fulfillment. I work for Medtronic, Inc as medical device specialist/registered Nurse. I am currently pursuing my master degree. My achievements: Have an adult foster care license. A strong and committed member of the Cameroon community organization in Minnesota. I have served several positions in the community which includes: Vice president of social committee, member of representative assembly and community outreach. In my local EXSSA MN chapter I have served several positions which includes: Publicity secretary, secretary and chief whip. I’m confident that with the opportunity granted me through this organization and with the strength of grace by His majesty, I will accomplish anything I set my mind to do. I as a financial secretary I intent use my potentials, talents to shine the light of hope to others. I will not stop doing it RIGHT until I finish the race and complete the purpose to which I was assigned. Mrs. Akpo-Esambe graduated from Saker Baptist College in 1976. Prior to her election as National Secretary, she was the President of the Members at Large (MAL) Chapter from 2015-2017. She had also served as the Vice President for MAL from 2014 -2015. At the National level, she served as an Election Committee member in 2013 and in 2015. Mrs. Akpo-Esambe earned an Associate Degree from The University Center for Health Sciences (CUSS), Yaounde, Cameroon. A BSc in Biochemistry, MSc in Biological Sciences, and a PharmD from Duquesne University in Pittsburgh, PA. 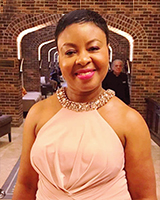 Prior to her Pharmacy Career, Mrs. Akpo-Esambe taught Anatomy & Physiology, Biological Sciences and the French language in a Community College and High School in Pittsburgh, PA. Presently, Mrs. Akpo-Esambe works for Walgreens Pharmacy in Lakewood, OH as a Pharmacy Manager. 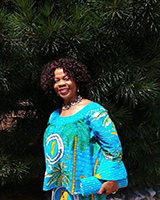 She is very involved in her local Cameroonian Community, and currently serves as the Bereavement Fund Coordinator of the Cameroonian Association of Greater Cleveland (CAGREC). She is also the Financial Secretary of the Bafaw Cultural Group in Ohio (Seh Nfaw). Mrs. Akpo-Esambe is married with three adult sons, and has two grandchildren. She enjoys ballroom dancing, reading and traveling. Caleche graduated from Saker Baptist College in 1997. She earned a BSc. in Physics from the University of Buea. She is currently a pediatric nurse in Houston, Texas and is wrapping up a master’s in Public Health (MPH). She lives with her husband and six kids (including a set of terrific two year old twins) in the Woodlands, Texas. 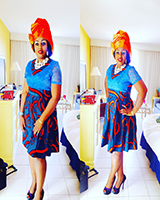 Mrs. Caleche Fanyui is fun loving yet very goal oriented. She enjoys quality time with her family. She is committed to Exssa and willing to serve and improve this alumna organization in every way possible. Among other things, the 7th of seven girls four of whom are Exssa’s, and a string of Exssa nieces and a grand niece. Her passion and dedication stems from her parents both “Silent Missionaries” Pa Aaron Yufanyi Abong and mama Amina Abong who served the Saker Baptist Missionaries and fervent advocate to promote the “Girl Child Education and Empowerment. Lucy Kendong was my name in Saker. My matricule number was 182. I went to Saker in January 1964 and graduated in June 1969. I worked in the Cameroon Public Service for thirty years and retired in December 2000. I relocated to the U.S. in 2005 and decided to follow my childhood dream of becoming a nurse. I succeeded in becoming an LPN at the age of 60. Praise the Lord! I went on to a Bachelor in Business Administration, concentrating on healthcare services, and then to a Masters in Health Services Administration. I am a mother of many children/grandchildren. I love to sing, dance, visit, cook, read books, and participate in Facebook. I also love to talk about the Lord at all times without fear or favor. He is the Solid Rock on whom I stand. Amen. 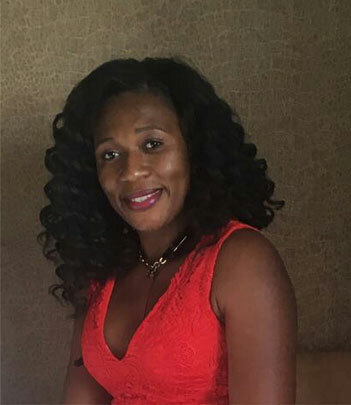 A class of ’84 graduate of Saker Baptist College, Agnes Njaba has a Master’s in Education Administration. She is an educator with Montgomery County Public Schools, Maryland where she teaches English Language learners. Within the ExSSA USA organization, she has held various positions at the chapter level; she served as Treasurer, Financial Secretary and Vice President of ExSSA DC Metro. She has also held the position of National Organizing Secretary. Agnes is passionate about the learning needs of the English Language Learners whom she serves at Albert Einstein High School, Kensington, MD. She also enjoys spending quality time with family and friends. 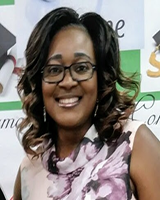 A class of ’84 graduate of Saker Baptist College has a Masters in Education Administration. She is an educator with Montgomery County Public Schools, Maryland where she teaches English Language learners. Within the ExSSA USA organization, she has held various positions at the chapter level; she served as Treasurer, Financial Secretary and Vice President of ExSSA DC Metro. She has also held the position of National Organizing Secretary. 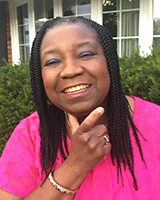 Agnes is passionate about the learning needs of the English Language Learners whom she serves at Albert Einstein High School, Kensington, MD. She also enjoys spending quality time with family and friends.